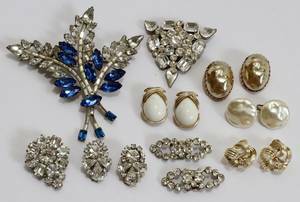 American silver porringer, early 19th c.
WEISS, TRIFARI, LISNER & RICHELIEU COSTUME EAR CLIPS, SHOE CLIPS & BROOCHES, & STUD SETS, 23 PIECES:Includes 1 leaf form brooch with blue and white faux stones, 1 brooch with circular and rectangular faux clear stones, 1 brooch with teardrop and round faux clear stones, 1 pair of ear clips by "Weiss" 1 pair of shoe clips and 1 pair of Trifari screw back earrings in gold tone, 1 pair of faux pearl earrings, marked "Richelieu", 2 brooches marked "Coro" and 1 pair of ear clips marked "Lisner". 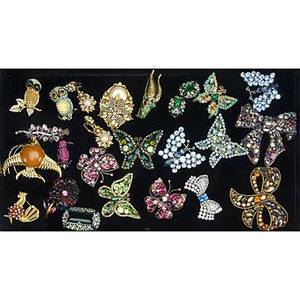 Stud sets include 1 pair marked "Kreisler" on the backs. 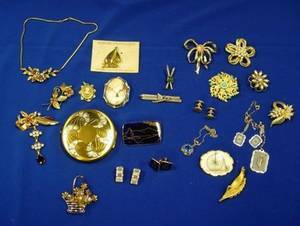 Eight pieces total. 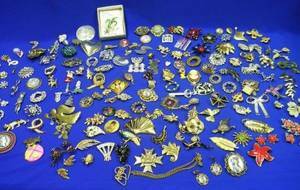 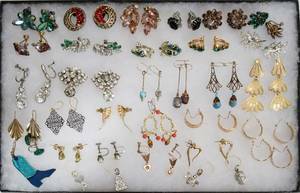 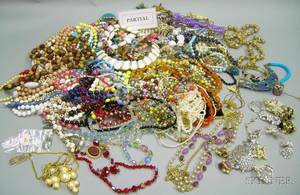 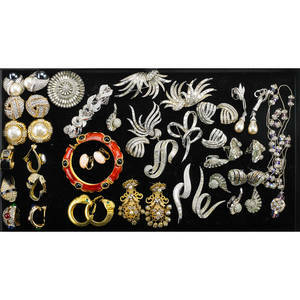 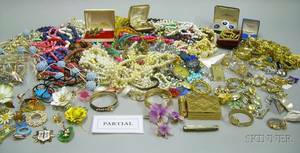 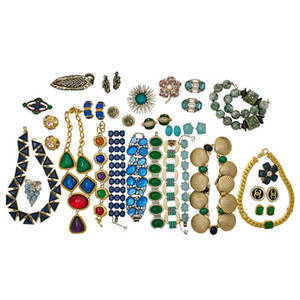 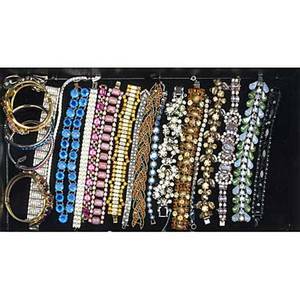 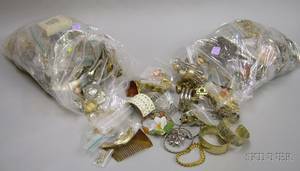 Vintage costume jewelry bracelets; twenty-one pieces, most in link styles, four hinge bangles and one pair of ear clips en suite; marks include weiss, kramer, regency, trifari and lisner"
Vintage costume brooches and earrings; twenty-one brooches, two with companion ear clips; includes thelma deutsch, art, weiss, de nicola, kramer, trifari, kenneth lane, coro, richelieu; largest: 3"